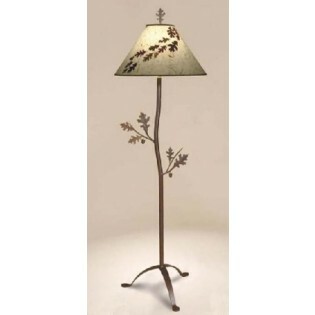 This rustic iron Oak Leaf and Acorn Floor Lamp, featuring forged branches and oak leaves, and will lend an outdoor feel to your living room or den. Hand-crafted in the U.S.A. This rustic iron Oak Leaf and Acorn Floor Lamp, featuring forged branches and oak leaves, and will lend an outdoor feel to your living room or den. Hand-crafted in the U.S.A. and available in your choice of black or rust finish, this rustic floor lamp comes with a bark paper shade adorned with real oak leaves.